My agility course is finally taking shape. I now have two tunnels, weave poles, and a fence jump. 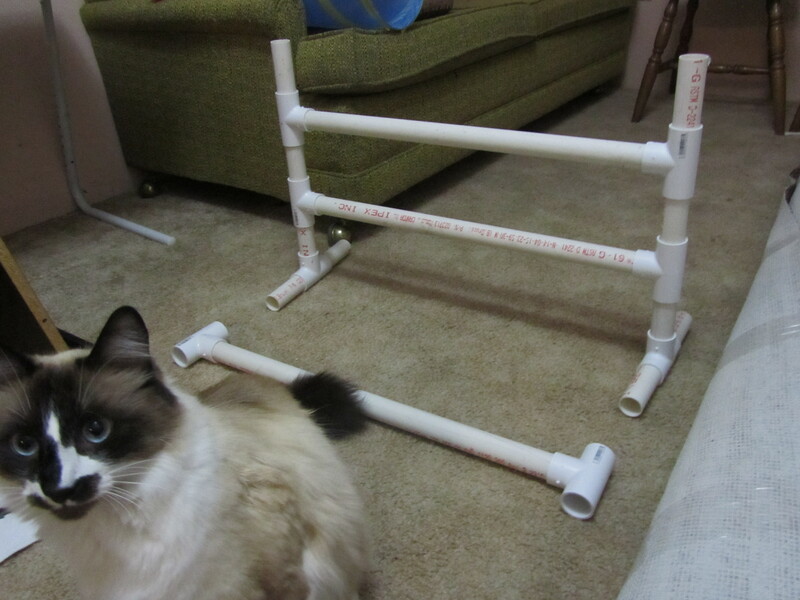 The new jump and weave pole obstacles were supurr easy to assemble. Mom bought three, ten foot lengths of one-inch diameter PVC tubing which were about $5.00 each from the hardware store. You could ask the store to cut them up for you if you don’t have an electric saw. 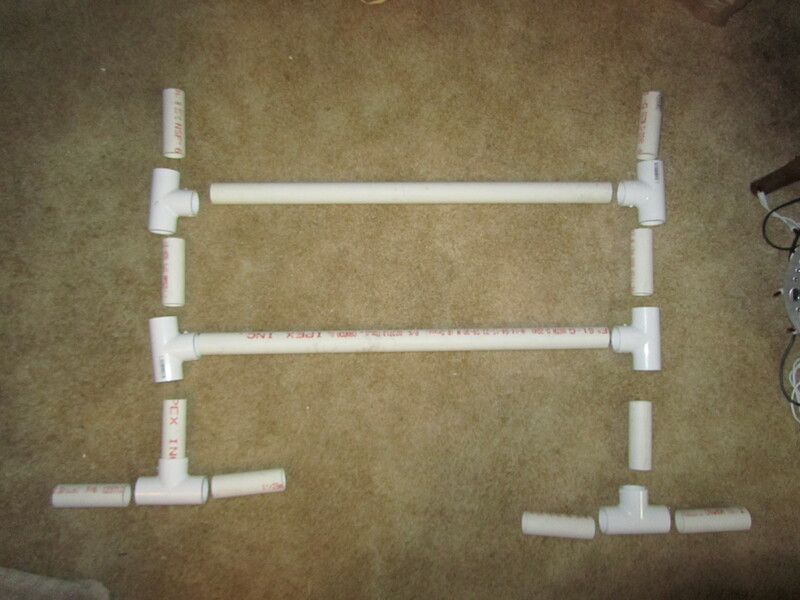 Then fourteen one-inch PVC T’s at about $1.50 each were required to join the pieces of tubing together. Fourty dollars including tax and 10 minutes later, that was it! Done! For now we have to work around the rolled up carpet in the middle of the room. It’s for our second 26 foot power boat we have named WOFTAM. I haven’t ridden in that boat yet because it’s my human dad’s work boat for his business, and now it’s getting a little much needed TLC. This was my first course run through. You can see in the video that I’m going to need a lot more practice. Mom is going remove one more of the jump rails and make it lower. I don’t usually have feathers on my target stick, but there was a hockey game on in the TV room where my dad was, and it was very loud and distracting. So mom stuck the feathers on to get my attention and it worked….maybe a little too much. This week we’ll focus on the weave poles to show you next Monday. Have a great week and paw paw for now! Weave Poles: 6 T’s, 4 x 2 ft PVC, 3 x 1.5 ft, 4 x 4 in PVC, and 2 x 3 in PVC pieces. Today furiends I’d like to show you how I am progressing with the tunnel obstacle. While my human was post-editing my video, I did a little web-surfing on the history of cat agiltiy. I was surprised to learn that the birth of dog agility was rather unintentional. Back in 1978 at London’s famous Crufts Dog Show, a horse-enthusiast was tasked with entertaining the crowd between events. He came up with an event that employed dogs doing equestrian-like feats. It was a hit, and then in 1986 it came to America under the title of the U.S. Dog Agility Association. It was so much fun that it has become the fastest-growing dog sport in history. 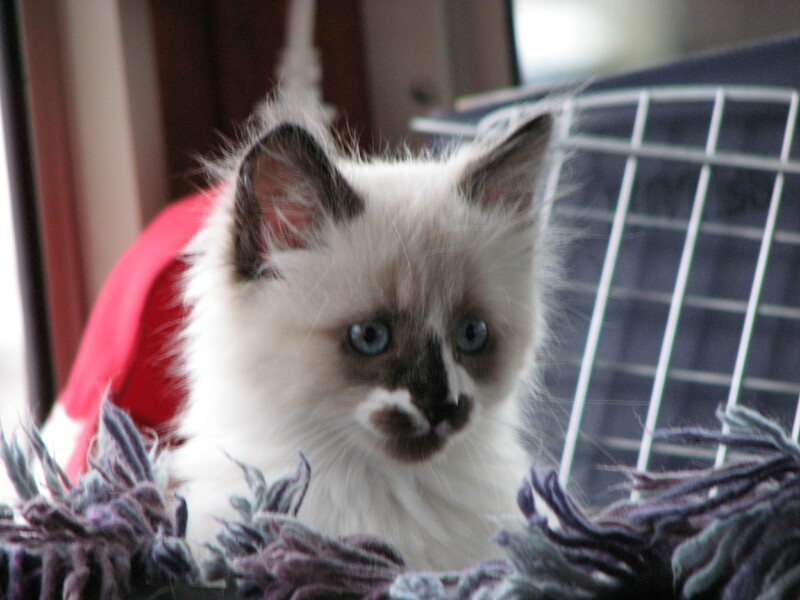 ICAT started 17 years later in 2003 by four cat show women who knew how beautiful cats could be when in motion. With their horse, dolphin, dog and cat show backgrounds they also knew how to train their furiends. The first ICAT event was held in Albuquerque, New Mexico, in October 2003 at a TICA cat show hosted by Enchanted Cat Club. ICAT and cat agility was a huge success! Exhibitors and spectators got caught up in watching the lively, athletic race of the cats and their handlers through the agility course. Ten years after that, on November 26, 2013, Bite TV and Force Four Entertainment announced the start of a fun new web and TV series called Battle Cats (6×30 scripted comedy). Battle Cats is a competition-based series that tests the true skills of us felines. 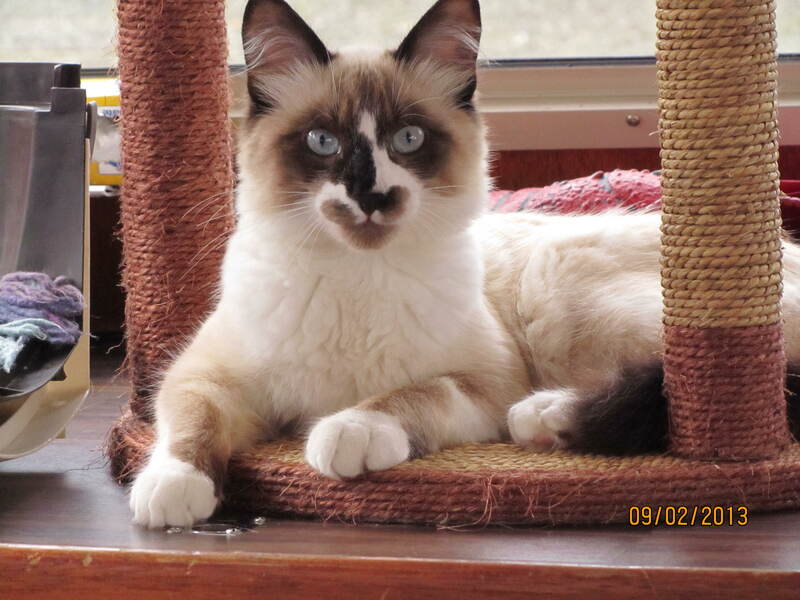 A cat agility arena was built right here in the greater Vancouver (B.C. Canada) area and was designed as the ultimate adventure course. Today my furiends is the first of our new weekly feature called “Motion Picture Monday” (I think we’ll shorten that to just “Movie Monday”.) The movies will document how I learn through clicker and target training to navigate various obstacles that are commonly found in an agility course. 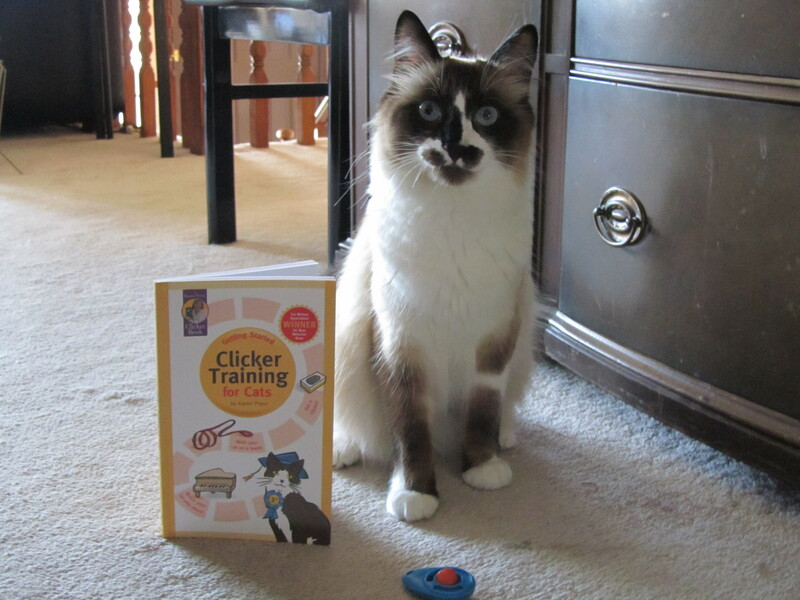 What is clicker and target training you ask? It’s a means of communicating with our humans in the form of a game, that not only shapes desired behaviour, but improves the quality of life for both of us, especially if you’re an indoors only cat. This is the method humans use to train dolphins. It’s is a science-based system called operant conditioning using positive reinforcement and a marker signal. It doesn’t have to be just for agility or cute cat tricks, (although I purrsonally think how much more adoptable a shelter cat would be if he/she knew a couple) it can also correct behavioural problems too by building new ones to replace unwanted ones. Mom is still learning how to be a trainer and is figuring it out as she goes, but as long as she plays with me, I’m OK with that. First she had to figure out the difference in her own mind between clicker and target training, what the purpose of each was, and when to use them. She’s come to the conclusion that the clicker is the signal used to mark or shape the behaviour, and the target stick is used to lure me around…to follow it. Both are rewarded with treats at some point. The key is practice, practice, and more practice…. and don’t forget the treats! Eventually the target stick won’t be needed when I have learned the hand and verbal cues, but we’re not at that point yet. Verbal cues would be spoken words such as “sit”, “up”, “down”, “roll over”, “jump”, etcetera, and we’d follow their hands instead of the target stick. Writing 101 Day 10, Today, be inspired by a favorite kittenhood meal. For the twist, focus on infusing the post with your unique voice — even if that makes you a little nervous. My earliest memory is of a not so inspiring kittenhood meal that consisted of some kind of a wet meaty slurry and a bowl of water. About a month later, the slurry became more solid and was joined by another bowl containing little bites of crunchy food. We called them crunchies because kibble sounded a little too dog. Turkey, chicken, beef and fish, my palate was well diversified, and well, still is. Once in a while my human mom would give me a tiny bowl of milk as she had done for all her previous kittens and cats, but then she was “advised” that cows milk was bad for us. I didn’t have a problem digesting it but she didn’t want to take any more chances even though her cat Coco had lived for 18 years supplemented with cows milk now & then. My humans would be away all day, so being more nocturnal than diurnal, I mostly slept during that time. They’d play with me in the evening, but when they went to bed, I’d be still be wide awake. I tried to sleep with them but after getting rolled on or kicked off the bed once too many times, I ventured back down to the basement and there I learned to hunt. Now being an indoor cat you’d wonder what I would hunt for. Bugs! You’d be surprised how many bugs would come out of the wood work in the dark. I didn’t have to go outside, they came in. Bugs are like vitamins. Spiders, moths, earwigs etc. Some tasted better than others, but they were all fun to try to catch. Another odd food that I like is lettuce and grass. My human dad would say I’m my mom’s cat because she likes her greens too. My dad’s not much of a green food guy at all. Mom took this picture of me because I was too young to do it myself. Writing 101, day 6. Today, you’ll write about the most interesting purrson you’ve met in 2014. In your twist, develop and shape your portrait further in a character study.